Fiber is an important part of a healthy diet. It can play an important role in weight control and can contribute to overall good health. Research indicates that consuming a fiber rich diet can actually decrease the risk of colon cancer and reduce cholesterol. Both soluble and insoluble fiber are positive additions to a healthy diet. Insoluble fiber, the type that doesn�t dissolve in water, is believed to reduce the risk of colon cancer. Consuming a sufficient amount of insoluble fiber has the positive effect of helping to keep the digestive system clean and functioning properly. Insoluble fiber improves both the bulk and solidity of waste. This results in a decreased occurrence of constipation because waste material is able to move through the colon more quickly. There are many healthy foods, such as vegetables, fruits, and nuts, that are excellent sources of insoluble fiber. Soluble fiber, which does dissolve in water, is credited with playing an important role in reducing cholesterol. Citrus fruits, apples, oat grain, barley grain, and legumes are excellent dietary sources of soluble fiber. 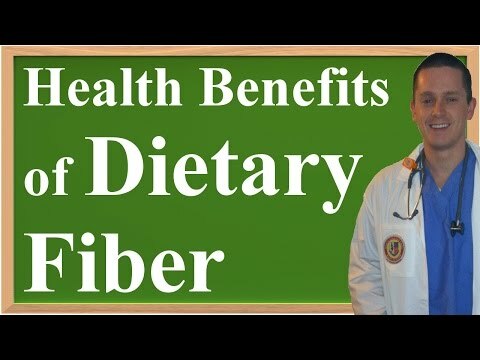 The recommended amount of dietary fiber varies depending on age. The recommended consumption for women under the age of 50 is 25 grams of fiber per day, and decreases to 21 grams daily for those 50 and over. Men under 50 are recommended to consume 38 grams of fiber each day, and those over 50 require about 30 grams of fiber on a daily basis. As always, food sensitivities may impact which fiber-rich foods you should consume and in what quantities. Oatmeal is an excellent source of fiber, with approximately four grams per cup. Raisin bran cereal is a good source of dietary fiber. While fiber content varies among brands, one cup of raisin bran cereal typically has about seven grams of fiber. Black beans and Lima beans have about seven grams of fiber per one-half cup serving. There are just under six grams of fiber in one-half of a cup of tomato paste. There are a number of fresh fruits that provide a delicious and healthy alternative to add fiber to your diet. Raspberries are among the highest fiber fruits, with more than five grams of fiber in each half-cup serving. Blackberries and blueberries both have more than three grams of fiber per half-cup serving. Apples have more than three grams of fiber each. Pumpkin is also a great source of fiber, also with more than three grams of fiber per half-cup. Some fiber-rich foods should be consumed with caution due to issues related to high sugar and fat content. If the fiber-rich pumpkin is baked into a rich pie full of sugar, it might not be the healthiest option. Bran muffins often have high fiber content, but tend to be very high in fat and sugar. While nuts are healthy and provide an excellent source of fiber, they should be eaten in moderation due to high calorie and fat content. Bread can be a great source of dietary fiber, but it is very important to select whole grain bread instead of that made with highly processed grain.